The Tulsa Police Department’s Riverside Division has begun a red light enforcement campaign to crack down on drivers who violate traffic light laws. Throughout the month of April, police will target drivers who run red lights and those who speed up before a yellow light to avoid being caught in a red light. The goal of the campaign is to reduce accidents caused by impatient drivers who choose to drive through a red light. Police participating in the campaign will monitor busy intersections south of 11th Street and west of Sheridan Road and will randomly select intersections with high accident rates. Police hope to eliminate the potential for serious auto accident caused by red-light runners. Those who have been injured after a driver ran through a red light can consult with an experienced auto accident attorney in Tulsa to discuss pursuing legal options. During the month-long enforcement campaign, police will issue fines against red light runners and drivers who disobey traffic light signals. 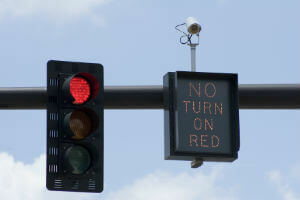 Drivers who violate the law will be issued a ticket for $200 if they are caught running a red light. Those who speed up as they approach a yellow light will be issued a $150 fine. In addition to fines, running a red light is a state violation that will add points to a violator’s driver’s license and increase his or her insurance rates for at least three years. Police have stated they will not provide any warnings to drivers caught running a red light or speeding up at the sight of a yellow light. Red light running is a serious problem throughout the U.S. that kills hundreds of people and injures thousands each year. In 2014, 709 people were killed in auto/pedestrian accidents caused by red-light runners, while approximately 126,000 were injured, according to the Insurance Institute for Highway Safety (IIHS). More than half of those killed in red light collisions are pedestrians, bicyclists and people in other vehicles struck by the red light runner. An IIHS study found that a red light violation occurs approximately every 20 minutes. In 2015, the AAA Foundation for Traffic Safety found that 39 percent of respondents in a survey admitted to running a red light within the last 30 days. Red light collisions(http://www.edwardslawok.com/red-light-accidents.html) are one of the most common types of accidents in the U.S. and account for 22 percent of all auto crashes, according to the IIHS. Programs like the Riverside Division’s Red Light Enforcement Campaign have shown to be an effective method for preventing red light violations. Those who have been affected by red light accidents may have legal options to seek compensation from the at-fault driver. If you or someone you love was injured in a red light collision, contact our Tulsa car accident attorneys. We provide potential clients with a free initial consultation and will determine if you are able to take legal action to compensate for your losses. Our auto accident attorneys in Tulsa only work on a contingency fee basis, so all our work is provided at no cost. You will only have to pay us if we recover damages for your claim. Contact us today.